I asked an adjunct professor for extra credit for her class and she said it was against Carroll rules for her to do this. Meanwhile, another professor I have is offering extra credit, and I know there have been other offers in the past. A) It only applies to adjuncts. B) It applies to everyone but professors know it's bogus and ignore it. C) It doesn't exist, and this random professor is lying...which is weird. We students need BANDWITH!!!! ARGGG! This internet situation is out of control. I'm surprised I could even get on lj. I couldn't get into my email. This is un-academic and unprofessional. Grrrr. Well, this me saying "hola". I'm going to be a feshman at Carroll in the fall, so I thought it a good idea to join this community. I'm currently majoring in Psychology, yet thinking about doing something in the field of electronics as well. 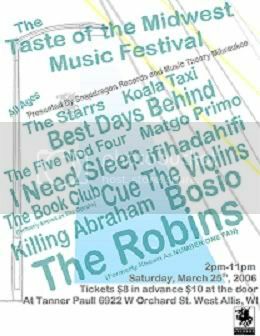 BEST DAYS BEHIND, I NEED SLEEP (Chicago), THE ROBINS ( formerly known as NUMBER ONE FAN), BOSIO, The Starrs (ex members of Anti Freeze), Cue the Violins, The Book Club (formerly known as THE OPRAHS), Ifihadahifi, The Five Mod Four, Matgo Primo, and Killing Abraham. An all day festival from 2-11pm! Come any time and see some of the most potential uprising stars! This is an all ages show! $8 in advance, $10 at the door. Any of you callage folk ever here of furries or even know some? Just wounderin? Just use your carroll e-mail as the login e-mail, because it works through school somehow. Good luck on finals everyone!! Try hard there is only a week or so left!!!! You can do it! Come to the folk fair!!! 3- 7 in the Ballroom! 1.50 for students, Free for Senior Citizens. i think it is 2 bucks for all otheres. It seems like they're gonna have some awesome stuff!!! how are everyone's semesters going thus far? any classes/professors that you're glad to have? any that you absolutely can't stand?